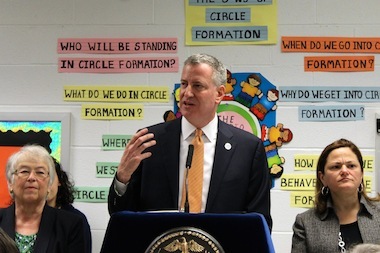 The city's labor union umbrella group approved Mayor Bill de Blasio's health care savings plan on May 2, 2014, the day after striking a deal with the city's teachers union. CIVIC CENTER — The day after announcing a nine-year, $5.5 billion contract agreement with the city’s teachers union, Mayor Bill de Blasio's health care cleared a hurdle with the city’s municipal unions on Friday. According to Arthur Cheliotes, the president of Communication Workers of America Local 1180, the Municipal Labor Committee’s steering committee accepted the terms of the United Federation of Teachers deal on Friday. The plan will still have to be approved by the members of each union — including the Patrolmens Benevolent Association, which was approved for mediation Thursday after its contract talks broke down with de Blasio's team. The unions all have to agree on the changes in order for them to take effect because they are all covered under the same healthcare plan. Cheliotes said the deal leaves each union with options for ways to cut costs to a level agreed upon with the city — but, like with the promised teachers union healthcare savings, specifics continue to be elusive. “We have agreed to, and will meet, those targets,” Cheliotes said. Some possibilities include pooling buying power on prescription drugs, or referring members to union-operated health centers, which other unions have seen help reduce costs. The agreement currently doesn’t include increases on premiums or copays for union members, but if the unions are unable to drive down costs, Cheliotes said that situation could change, as the members could have to pitch in to make up the difference. “These are reforms that have been spoken about for years, and we are only securing them now because we have created an atmosphere of mutual respect and common purpose,” de Blasio said.